Glasgow four-piece Verse Metrics don't waste any time. Their first gig was less than a year ago, and yet here I am sitting listening to 'VM1', their confidently presented debut EP, looking at a tightly designed, and straight-to-the-point website with a whole host of glowing media reviews that drop names like Biffy Clyro and Mogwai. Well played, sirs. Of course, knowing how to market yourself is only half the battle, so on to the music. 'VM1' is nothing I haven't heard before- its sound has been in circulation for some time and is arguably beginning to define the Scottish "alternative rock" scene; Horoscopes features stuttering drums, melancholy, chiming chords, soft vocals and yes, a xylophone, before building up to a climax and letting itself back down, before doing it again. On paper it's a formula I hear all the time. In practice, the results are admittedly pretty. In fact, they are quite beautiful. 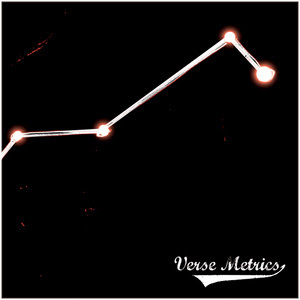 That is what grabs me about Verse Metrics: they're doing what a lot of bands are doing, but they're doing it well enough to be better than most of them. The musical maturity and dark Interpol-esque tension in songs like lead track Tired Lights hold a certain promise. It feels like the work of a band focused on the long-term rather than some scenesters jumping on yet another bandwagon. The relatively hyperactive Fractions features clattery, dissonant chords without descending into any tech-for-the-sake-of-tech math-rock attempts, showing some reassuring versatility in the band's dynamic range. Husker then brings the overall mood down into a defeated-sounding, gloomy waltz, with Sad Bones providing a pulsing, almost euphoric finale (I have a funny feeling it's about drowning yourself and the world not really caring, but I'll still say it's euphoric. On second thought, it's quite depressing). The overall result is a complete-feeling, focused EP that demonstrates a band with a whole load of real potential. Whether or not Verse Metrics disappear with changing trends is something only time will tell, but 'VM1' hints at a band that are here to stay.